It’s my pleasure to welcome Peng Shepherd to the blog today! The Book of M, her upcoming debut novel, is partially inspired by Zero Shadow Day, during which peoples’ shadows temporarily vanish in certain parts of the world due to a combination of the current angle of the sun and their latitudinal location. Though this absence of shadows usually lasts only a few minutes, The Book of M features a near-future scenario in which some mysteriously lose them for far longer and gain a power—but at the cost of their memories. 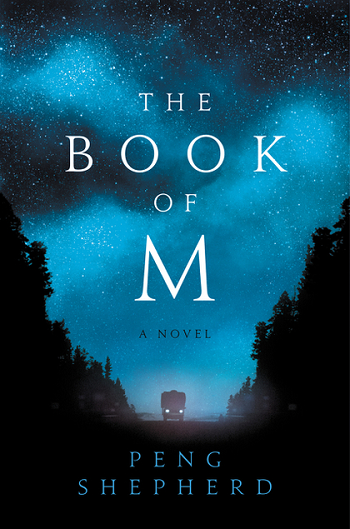 I’m looking forward to The Book of M releasing on June 5! “There’s no time,” my mother said, flashing her ticket at me. It was 1998 and I was eleven years old, all knees and elbows and braces, standing in the bookshop of the San Juan, Puerto Rico airport. My family was on its way to Tobago for spring break vacation, about to board the final leg of the flight. I edged deeper into the shop, racing the clock, searching desperately for something in English and for kids. Then I saw it amid the cluttered stacks—not shelved properly, but tucked on top of a row of other paperbacks. The book looked old. Very old. As if it had been sitting there for decades. It had no price tag, and didn’t seem like something that was supposed to be there at all. The cover was faded blue, a pale clouded sky reflected against an ocean. In front hovered the face of a woman wearing some kind of steampunk helmet. 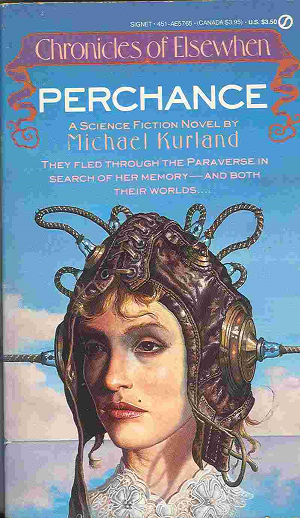 Purple and white letters proclaimed, ‘Perchance: The Chronicles of Elsewhen, by Michael Kurland.’ It was a story about time travel and parallel universes. I grabbed the book and dashed to the front of the shop, where my mother quickly fished some cash from her purse. Once squished into my window seat, I cracked the cover, drawing the irresistible musty scent of pages long unopened into my nose. The book already seemed important even then—the way I’d found it hidden backwards on the shelf, the lack of a sale sticker, the ancient smell of it. “Delbit grabbed hold of Exxa’s arm. ‘They’re coming up here. Take a deep breath and let’s go somewhere else,’” was the opening line. Perchance was the start of my love affair with science fiction and fantasy. I liked reading before, but my selection had been limited to whatever my parents bought for me. This was the first time I’d chosen a book myself, and it made me finally realize what kind of stories called to me, and what I wanted to do when I grew up. It was like magic. I’d like to pause here on that note and say, yes, the title of this essay is written correctly. I didn’t mean the “time travel” book. I meant the “time-traveling” book. A year later, my family moved across Phoenix, to the other side of the city. I’d since read everything I could get my hands on at the library, but Perchance still had a special place in my heart. I packed it into a box of books wrapped in paper towels, worried about it getting damaged, and taped the lid closed. But at the new house, when I opened the same box to unpack, somehow, Perchance wasn’t there. I searched everywhere, but there was no book. My mother was skeptical, but I was sure I’d put it into the box, and the box had been still sealed when it arrived. For me, the explanation was clearly that Perchance disappeared itself. It was a book about just that very thing, after all. I firmly believed it for a while, but eventually, the mysterious vanishing began to feel like a childish tale. Something I’d misremembered, or embellished. Magic wasn’t real, but grades were—and final exams, and SATs, and college applications. Like it does for so many of us at that age, my pleasure reading and writing took a back seat to course-mandated book lists. There was no place in serious literature for space ships or wizards, I was told. Then I graduated and got my first full-time job, where I read work emails all day, and wrote even more work emails all night. I had forgotten how much I loved the stories, loved discovering the worlds and cultures, loved the feeling of wonder. I had lost my imagination. But a decade later, when I was moving from one apartment to another in Arlington, Virginia in my early twenties, my hands closed around the light blue cover of a weathered paperback novel. I pulled Perchance out of my suitcase and stared, awestruck. It had come back to me, to prove magic was real. I rediscovered my love of genre. 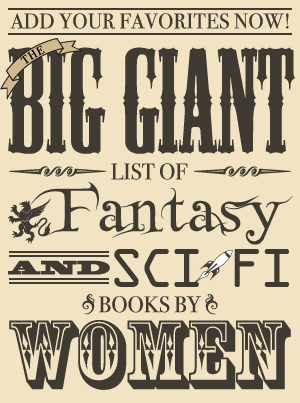 I devoured novels by Ursula K Le Guin, China Miéville, Octavia Butler, Neal Stephenson, Ted Chiang, N.K. Jemisin, Charles Yu, Jeff Vandermeer, and more. I began writing my own fiction again, passionately, obsessively. I felt alive again for the first time in a long time. I felt magical. But this time, I wasn’t upset. If anything, it reminded me even more of how important these kinds of books are. Books that open your mind to new realities; books that bend the world, or do away with it for something completely new; books that tell deeper truths precisely because they are fantastical or unbelievable. Impossible or not, I wished Perchance well on its adventures, and believed I would see it again someday. When I was nearly finished writing the manuscript that would become my first novel, The Book of M, it finally appeared again, as suddenly as it had vanished. I found it in another room entirely, in a stack of books I hadn’t touched in years. These days, I keep Perchance next to my current writing desk. I check on it nearly every time I walk by—it’s almost subconscious at this point, a quick glance that doesn’t even slow my step—but every time it makes me smile to see it still there, still with me. Maybe this time it’ll stick around. But even if it doesn’t, good books never really leave you. That’s the magic of them. 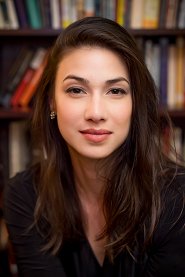 Photo Credit: Rachel Crittenden Peng was born and raised in Phoenix, Arizona, where she rode horses and trained in classical ballet. She earned her M.F.A. in creative writing from New York University, and has lived in Beijing, London, Los Angeles, Washington D.C., Philadelphia, and New York. The Book of M is her first novel.